Coal-fired electricity is one of the biggest sources of greenhouse gases, and thus is a leading contributor to global warming. Not only that, but it can cause smog, acid rain and toxic air pollution. It’s not good for the environment, or for us. An article by Joanna Zelman of The Huffington Post states that pollution from coal-fired power plants actually causes 13,000 deaths a year. Enter Ontario. This province has enacted new legislation that will permanently ban coal-fired electricity there. The Ending Coal for Cleaner Air Act is the first of its kind in North America. It is also the largest greenhouse gas reduction project on the continent, according to the Environment News Service. “Our work on eliminating coal and investing in renewables is the strongest action being taken in North America to fight climate change. I believe we can work together as stewards of our natural environment and protect our children, our grandchildren and our fellow citizens,” said Ontario Premier Kathleen Wynne. 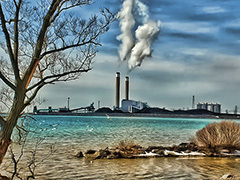 The Nanticoke Generating Station is the largest coal power plant affected. It once had eight generating units to power 2 million homes a year. By the end of 2013, it will no longer be using coal to ensure reliable power supply. In place of coal, the plant is going to switch to renewable power generation. Posted on November 29th under Pollution Reduction.